The Cincinnati Reds star first baseman, Joey Votto, has been placed on the disabled list with "Stress Problems" which we're left to assume are the result of his inner ear problem. Why the Reds are calling this stress is a mystery to me. But the Reds do a lot of things I don't understand. Why was Joey Votto continuing to fly around the country with an ear infection anyway? They made a serious problem even worse by not simply putting him on the DL when they discovered the problem. They've also hesitated to disable their other injured players. Brandon Phillips is now playing with a fracture in his thumb. If he keeps batting, it will only get worse. Dizziness from the inner ear infection that's been dogging Reds first baseman Joey Votto struck again Friday night. The club has avoided putting Votto on the disabled list for more than two weeks but that could change soon. Votto, the team's best hitter, started against the Brewers but came out of the game before the Reds took the field for the bottom of the second inning. Catcher Ramon Hernandez moved to first base and Ryan Hanigan took over behind the plate. After the game in the manager's office, a 40-minute closed-door meeting was held with Reds manager Dusty Baker, general manager Walt Jocketty, head trainer Mark Mann and Votto. No roster move was announced once the door opened, but Baker said that Votto would not play on Saturday. Votto emerged from the meeting and appeared to be in a good mood but declined to comment to reporters. "Not right now," Votto said. Baker was asked if Votto was OK.
"No , not really," a somber Baker responded. "He felt similar symptoms that he's been feeling in the past and just came out." It was the third time since May 11 that dizzy spells have forced Votto out of a game. On May 21 after a battery of tests, the inner ear infection was revealed. The conditions of the inner ear infection can be exasperated by flying, which Votto did with the club on Thursday during the off-day. Unlike with the previous incidents that happened on the West Coast following flights, the trip to Milwaukee is a relatively short one. Replacing Votto, especially in NL-only leagues is going to be difficult. But if you're in a weekly transaction league or just a league with some owners who are slow on the draw there may be an option for you. The Chicago Cubs recently called up slugger Jake Fox. Fox is a former catcher who has struggled to find a position. He has spent most of his time recently at outfield and first base but has also spent time at third base. The guys at the Fake Teams Blog have posted an informative article that may discourage you from picking him up. But after you're done being discouraged note Fox's slash line of .423/.503/.886 that's insanely good. I don't care how bad his defense is or what league he's been playing in or what he's been injecting (that's just a joke I haven't heard a thing). 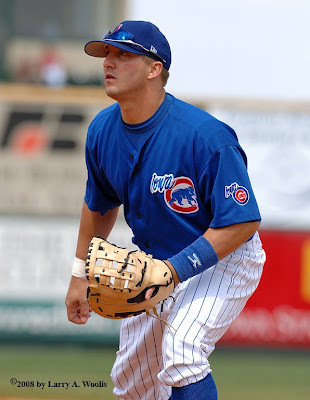 Fox is blocked by Derek Lee at first base but the Cubs could squeeze him into the outfield to fire up the offense. Fox is also a prime candidate to DH in inter-league games. I haven't checked the schedule for the Cub's AL games (okay I did, six games against the White Sox and Tigers to end June) but I'm trying to be optimistic here. Fox was leading the minors with 17 homeruns at the time he was called up. If there is a manager on the planet I trust to fit to fit a bat like this into the lineup it is Lou Pinella. I won the FAAB Bidding in my primary NL-only league with a $32 bid. Even if he doesn't play much it can't be much worse than collecting awful at-bats from the scrubs likely to be on the waiver wire at this point in the season. Question: Can Liriano and Lester Recover?